I can't remember exactly when I first met Bill Branthoover but I'm certain it was at a Historical Society event. I learned we were neighbors on the Notch Road and also that just because he wasn't a year round resident it didn't mean he and Margaretta were snow birds. Rather, they spent the Winters and mud seasons in northern Ohio where Bill had taught and worked as a principal for much of his adult life. Bill spent many summers growing up in Montgomery, enjoying the hospitality of relatives and friends, and adventures every day. One of his favorite stories was about the time he and friends were passing a summer afternoon throwing rocks at the telephone and power lines. They didn't know that when they scored a hit on the phone lines it would cause the line to ring at the switchboard in the Village. When the operators put out an All-Points-Bulletin on the mischief makers they were quickly identified and justice was meted out. Bill was a very early and enthusiastic MHS member. 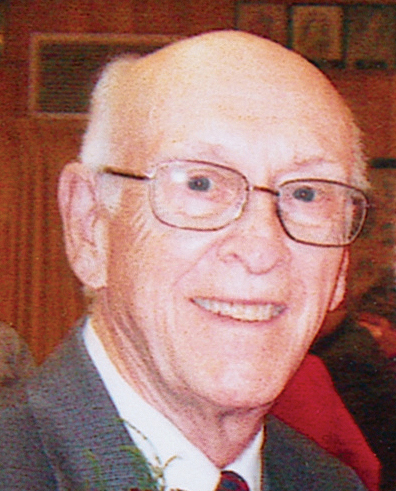 He researched and wrote genealogies of the early town families, compiled a history of the Baptist church and Montgomery schools, wrote a booklet on Montgomery cemeteries, and co-wrote the Town's first history published in 1976. He remained a major contributor to the second edition published in 1991, patiently putting together its first index, hand typed on index cards. Bill was also instrumental in reviving the Town's Memorial Day commemoration and organized other events like the vigil at Pratt Hall after 9/11. Bill donated all of these efforts to the MHS and never took a dime. He received a well earned Lifetime Achievement Award from the Vermont Historical Society in 2007 for enduring and significant contributions to the heritage of our community and Vermont. Bill served the MHS in a number of leadership positions too. As archivist he collected and accessioned nearly 1,000 artifacts. He was also a member of the Board of Directors and Vice President for 13 years, filling in as President for 3. He was our heart and soul. Bill passed away peacefully in his home in Ohio in late October. He was interred in the Center cemetery. In celebrating his life I realize that I always measured our successes as an organization on the Branthoover scale, that is, what would Bill think? He could be a hard man to impress but said several times how pleased he was with what we were doing, from preservation work on the Hall, to documenting the stained glass windows, to the recently published third edition of the Town History. I will miss his booming voice, wit and good humor, and comradery. Our best wishes to Margaretta and his entire family. Thank you Bill, you will be missed. The West Wall project is nearly complete. 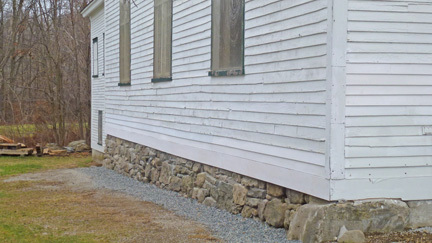 The timber framing repairs are done and a new stone foundation is in place. 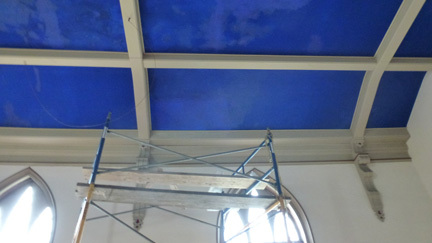 The plasterer/painter is at the point where he needs the stained glass windows re-installed to finish the ceiling paint in the right lighting conditions. 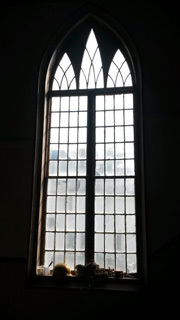 However, the Board decided to delay these tasks to allow us to remove and restore the two clear glass lancet windows. The ten separate sashes will be removed by local artisan Jeff Fellinger in early February. Glazing will be removed, woodwork will be repaired, broken period glass replaced, then they will be reglazed and painted in his shop in Newport. They should be re-installed by May 1st. 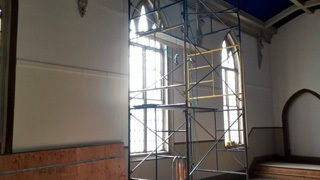 We will then re-install the stained glass windows, finish the plaster and painting, reinstall the electric and oil lanterns and pews, then give the Hall a good cleaning. We plan to have a fete to celebrate the project's completion and to thank all of our members, workers, and contributors. Stay tuned for details. The decision to delay and add additional work forced us to cancel our normal Christmas programs. In fact it would have been difficult to get the Hall ready in time regardless. We are looking forward to next year's holiday season events already. So far, we've paid out approximately $118,000 in direct project expenses and anticipate at least another $15,000 for the work described above. We have received a partial payment of the State Division for Historic Preservation grant, and anticipate receipt of additional grant money pledged from the Eastman Charitable Trust in 2015. While the work will take a bit longer than anticipated we are on budget to complete all the necessary work. Thank you all! By popular demand we partnered with the Black Lantern and had another venison brunch event. Our thanks to Greg, Hannah, Matt and crew for another tasty and fun event. We are also continuing to make engraved bricks available. They can be purchased on our web site. Interested? Questions? Please email us. Thanks to all of you that have already designated us. We are one of the few non-profits that have had enough program members to be eligible and to receive an annual donation every year. 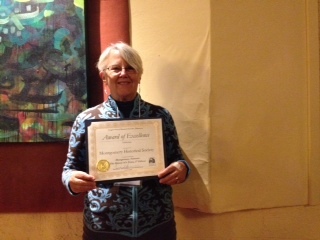 On Halloween the Society and Board member/Author Jo Anne Bennett were recognized with an Award of Excellence for the recently published 3rd Edition of “Montgomery, Vermont: The History of a Town”. The accolade was announced by the Vermont Historical Society (VHS) and League of Local Historical Societies (LLHS) at its annual meeting at Brattleboro, VT. In making the presentation, Mark Hudson, Executive Director of the Vermont Historical Society, noted “Jo Anne Bennett had the toughest task, distilling over twenty years into this new chapter." Jo Anne elaborated “It was such a tremendous enjoyment and privilege for me to have an excuse to talk with so many people I hadn't known before. And such an eye opener about the amount of time and energy so many Montgomery residents put into making their community work. This is civic engagement at its very best.” This is the tenth VHS/LLHS award received by the Montgomery Historical Society and its members since 2007. Not long ago we discussed a number of examples of how the MHS supports authors, genealogists, and others answering questions about Montgomery's heritage. One, author Pierre Home-Douglas, has a family connection to Montgomery and spent many vacations at his parent's home on the Fuller Bridge Road. He recently had an article titled "Discovering Montgomery" published in the Winter 2014/2015 issue of Vermont magazine. He interviewed old timers, newcomers, and those in between to try to introduce the reader to what makes this community special. The article features a picture of Pratt Hall and quotes from Duane Jewett, Rolf Anderson, Greg Lucas, Jo Anne Bennett (erroneously identified as Jo-Ann Bailey), Hubert Daberer, Jack Quinn, and Scott Perry. Home-Douglas' byline says "Despite the changes that time has wrought, this mountain town hasn't forgotten its history." Gores were generally unincorporated areas often made up of small pieces of land not included in other towns. There were several tracts of land granted to Samuel Avery as compensation for land he lost after land disputes from conflicting VT/NY grants were resolved. 1. How many Averys Gores were there? 2. How many are there today? Where? Members may remember that our success with the West Wall Capital Campaign necessitated our first ever federal tax return, a 990EZ, for the tax year 2013. It is now in the books. Our 2013 end of year net (cash) assets were $131,392. One of the requirements of the return is a certification that we are indeed an publicly supported non-profit, which the IRS defines as an organization receiving more than 33.3% of its revenue from qualifying sources. According to the IRS criteria, we easily met the standard, receiving 68.1%. We will be filing additional 990EZs for at least the next two years based on a three year running average of our fund raising exceeding $50,000. Our thanks to Sue Wilson and Marijke Dollois for all the work to assist the CPA in preparing all the forms. February 1781: Vermont's first newspaper published, The Vermont Gazette in Westminister. March 1858/9: Montgomery receives portions of Lowell and Avery's Gore. Boundaries not finalized until the 1960s.